There used to be a time when Motorcycle helmets were very simple domes that were meant to cover the head and were made of brittle material that would shatter at the slightest impact. But just as technology has evolved with time and motorcycles have developed into something more than vehicles meant to take people from one place to another, helmets have also come to mean something more to people. Nowadays we demand more from our products and that is applicable to helmets too. They are not just meant to protect our head from grievous injury in case of a mishappening, but they should also be comfortable, stylish and multifunctional. There are several kind of helmets that are available in the market these days that support features that will meet every need of yours. Whether you want a helmet that comes integrated with bluetooth speaker system, or one that has enough space for your prescription glasses. A few of them completely negate the use of a pair of sunglasses, as well as some that come with antibacterial lining that will prevent growth of harmful microorganisms inside your helmet. But it can be a daunting task to find the perfect match for you. With so many brands and options available, how does one go about picking the perfect product for themselves? Worry not, you have landed at the right place as we are here to help you. We have tested 14 products from all over the world to find the best of the helmets for you. Read on to find out more. This is one of the most famous and reliable helmets in the market. With his four-star rating on Amazon over nearly 700 customer reviews, you can rest assured that this is indeed a solid investment. Bell Qualifier helmet comes in 7 sizes, which makes it easy to use for people of all genders and ages. There are also several colour options, so you can ride your bike in style. The shield of the helmet is clear by default, but if you are someone who rides in bright sunlight on a regular basis, you can get a tinted shield helmet, by clicking on the option while ordering the product. There is another benefit of the shield with this product. It is anti fog, anti scratch and UV protected. So not only can you travel safely in foggy weather when normal shields would get covered with water droplets, but you can also rest assured that the helmet will protect you from the harmful UV rays when you travel in harsh sunlight. It is also an anti-scratch shield, so in case of a miss-happening or accident, the shield will remain good as new. The cheek pads of the helmet are designed in such a manner that they simulate the natural contour of a person’s cheekbones. This is one of my favourite features because not only does it make the helmet look more stylish and sophisticated, but it also fits my head most snugly. The material of the helmet is lightweight. It is made of polycarbonate and ABS shell construction which makes it an easy to use the product. During long journeys and bike rides, you won’t feel like a ton of bricks is sitting on top of your head, an essential feature for a helmet. The product also comes with a padded wind collar. This helps in reducing the noise of the wind slapping against your ears as well as the traffic noise that comes with roads in Metropolitan cities. Your ears won’t feel like they are being blasted by high decibel noise when you are travelling at fast speeds on your bike. The interior of the helmet is washable so you can easily keep it clean and maintain the hygiene in the product. The cool new addition of speaker pockets will allow you to listen to unlimited music by fitting in your existing headphones inside the helmet. The shield itself is easy to use. With just a click, you can release the shield which makes it easy to replace without the use of any complicated tools. Another one of my favourite features is that the chin strap comes with padding, making the helmet extremely easy to use in long journeys. The closure of the chin strap is D ring type, one of the most secure closures in the market right now. Bell qualifier comes with a 5-year warranty and meets the standards set by FMVSS 218. The 1Storm Helmet is one of the best-rated products on Amazon with the rating of 4.5 stars over nearly 600 customer reviews. The helmet is also really cheap compared to its other competitors in the market. It retails for only $69.95. It comes in 5 sizes ranging from extra small to extra large and each of the sizes is marked with the measurements in inches, so it will be very easy to pick the right product for you. It comes in more than 20 colours, ranging from pink to orange, green, black, and blue. There is so much variety that you can even match your bike with your helmet. The products come both in glossy and matte colours so you can choose whatever your heart desires. The shield of the helmet comes with dual lens design. What it means that that the inner side of the shield is smoked to protect you from excessively bright light and UV rays of the sun, and the outside of the lens is a clear shield for better visibility in harsh weather conditions like fog. The helmet is equipped with an advanced modular flip-up design to help with easy usage of the product. It is made of lightweight material that will feel like air on your head even when you are riding for hours. The design of the helmet is aerodynamic, that is it is meant to reduce air resistance at high speeds. The outside of the helmet is made of thermoplastic alloy shell which makes it not only an extremely durable and strong product but also gives it the characteristic lightweight design. The sleek and sophisticated looks are not just pretty but the finish itself is UV protective. So the paint of your helmet will last much longer than any other model. The inside padding is removable and washable, so you will find it easy to maintain the cleanliness and hygiene of your helmet . The sun shield is retractable for all those times when you are riding at night and need to look at the road clearly. Additionally, there is sufficient room inside the product to fit prescription glasses, for those of you who have been prescribes those by an eye doctor. The outer tinted lens can be lifted up without removing the entire mask, in case you are riding for a prolonged period of time at night. Unfortunately the helmet does not come with a quick release strap, and that is my biggest gripe with this product. 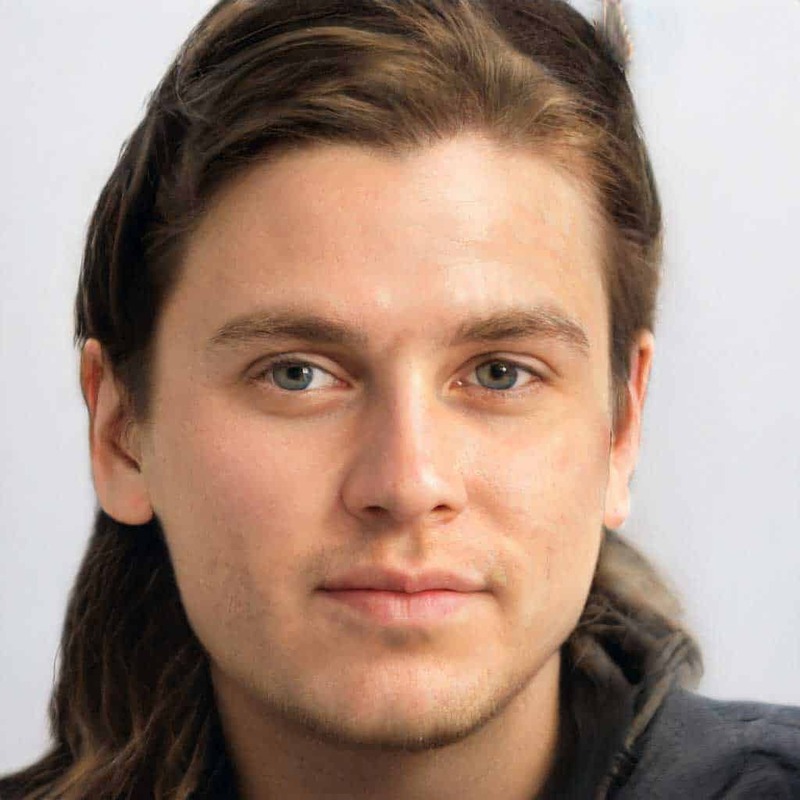 It can be quite clumsy to use the chin strap because of absence of this feature. The absence of a wind collar is also quite conspicuous. 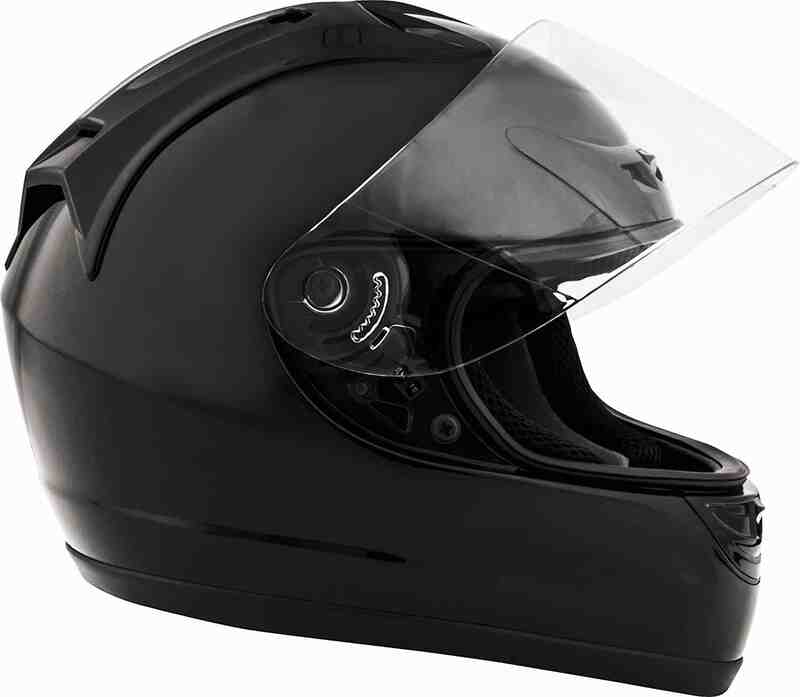 This can be quite a loud helmet if you are travelling at high speeds for a prolonged period of time. Retailing for $59.99, the ILM Full Face Motorcycle comes in four sizes, from Small to Extra Large. It is not as versatile as other products listed here, but it is still quite easy to find a product that will fulfill your requirements. All the sizes are marked in centimetres, in inches, and hat sizes to help you pick the best product for you. It comes in seven colours, including black, silver, white, yellow, and blue. This helmet has a dual shield. The inner side of the lens is clear for riding during the day and night. The outer smoked or tinted lens is useful for all those times when the sunlight is extremely harsh or the weather is foggy. You can also fit your prescription glasses inside the helmet very easily. The visor of the helmet is designed in such a way that it provides a wide angle view of your surroundings. It also comes with anti scratch glass, so you don’t have to worry about your visor getting ruined in case of a minor accident. The anti fog function is helpful during winters and when there is too much water vapours or humidity in the the air. One of the most unique features of this helmet is that it comes with a neck scarf which can be used during the winters to save yourself from harsh cold. The scarf is removable, so it will not be suffocating during hot conditions. The oval shaped helmet has an aerodynamic design and the construction is streamlined in such a way that air resistance is reduced and wind noise is almost negligible. The shell of the helmet is made of lightweight and durable ABS material, so it is easy on the head during long journeys. The design is advanced and modern. One of the most easy to use features on this product is that the chin strap comes with quick release clasp, so you are not struggling again and again to open and close the strap. The inside of the helmet is lined by comfortable and soft pads that you can remove at your will to clean them. The helmet meets safety standard set up by FMVSS 218 and DOT. With star rating of 4 stars over nearly 500 customer reviews on on Amazon, Fuel Helmet retails for $54.22. It comes in three sizes, from medium to extra large. It is less versatile than other products mentioned on this list. One of the most unique features of this product is that it comes with dual vented diffuser. What that means is that while using the helmet there is sufficient air flow inside the helmet so that you don’t feel suffocated. It has brow vents for better circulation of the air inside the helmet, along with presence of vents in front of and at the rear of the helmet. The internal channel vent system equipped with all these vent system is one of the greatest USPs of this product. This is the perfect helmet for use during hot weather. The shell of the helmet is made of a lightweight and thermoplastic material, so it is easy on the head during long journeys on your bike. It is a product that is ideal for maximum speed and comfort, paired with unquestionable safety. the cheat pads that are fitted inside the helmet are removable so you can clean them during extremely hot weathers when there is a lot of sweating inside the helmet. The shield of the helmet comes with a quick release function. It is extremely easy to use and not clumsy at all. 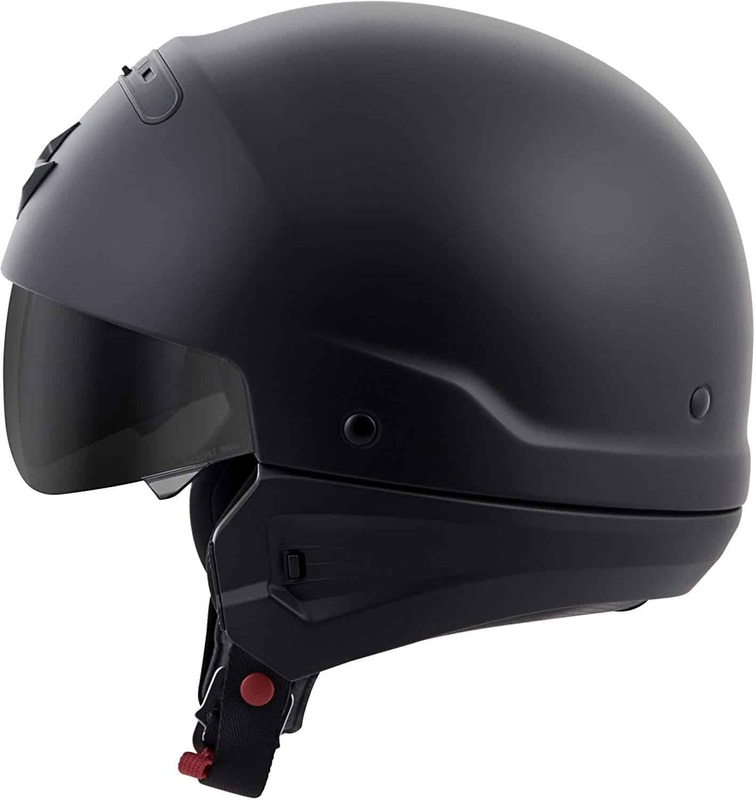 The helmet comes in just one colour – glossy black. The design is very stylish, sleek and modern looking. The paint of the helmet is UV protected, that is, it will not be easily damaged by the harsh rays of the sun. The chin strap of the helmet is very easy to use too because it comes with a D ring closure. This feature is missing in many helmets that are much expensive than the Fuel helmet, so that is another point that is in the favour of this product. The D ring keeps the helmet fitted around your head like it was made specifically for you. It also keeps excessive wind away from your face while riding at high speeds, which not only makes it a more comfortable product to use, but also reduces wind noise considerably. It is a DOT approved product and it meets all the standard set up by Federal Motor Vehicle Safety Standards 218. The 1Storm Adult Modular Helmet has a rating for 4.5 on Amazon, with over 400 customer reviews. It retails for $59.95 and comes in four sizes ranging from small to extra large. All the sizes are mentioned in centimetres and inches to help you pick the best product for you. It also comes in a variety of colours suitable both for men and women, so you can pick one according to your needs. The visor of the helmet is designed with an advanced modular and flip up design which is easy to use and makes it an extremely versatile product. It is easy to remove the visor completely so it is a very diverse helmet which can be transformed from full face helmet to half face helmet very easily. There is a mouth cover inside the helmet which prevents fogging up of the visor when you are riding during winter months. This is especially helpful for people who live in cold weather. There is also sufficient space inside the helmet to snugly fit in your headphones if you enjoy music during your rides, as well as prescription glasses without slipping down. The helmet also has front and back vents when which keeps sufficient air circulation inside the helmet and keeps your head cool even in hot weather. The design of the helmet is also easy for looking backward and forward without obstructing movements. The visor also comes with dual lens design. A smoked lens can be used during extreme sunlight when the sun hits you in the face and it can be hard to see. It eliminates the need of using sunglasses in day time. The clear shield of the helmet is ideal for use during night and when the weather is cloudy during daytime. The helmet is made of thermoplastic material which is study and solid. It also has an aerodynamic design which reduces resistance during riding at high speeds on your bike as well as taking care of high decibel wind noise that you experience when travelling at at a great speed. The alloy shell of the helmet it makes it compact and durable. The outer side of the helmet is is covered with UV protective clear paint which protects damage from the harmful rays of the sun. The inside of the helmet is lined with comfortable and soft padding which can be removed and washed to maintain the hygiene inside your product. Now coming to the drawbacks of the product. Because of a missing wind collar, there is some wind noise that can be heard when going at high speeds. The helmet also runs a size smaller, so if you normally use a medium-sized product, go for a larger size with this model. Lastly the chin strap is not as comfortable as other products on this list and the button placement for chin strap is not well thought out. Torc T14B Full Face Helmet Is the perfect machine for those of you who are tech savvy and require more from your helmet than normal durability and strength. The helmet retails for $199.99 and it comes in 6 sizes, from extra small to double extra large. The expensive price of the helmet can be explained by its shell which is equipped with bluetooth technology. The Blinc Bluetooth system comes fully installed and integrated with the product. What it means is that you can basically use your helmet as Bluetooth enabled headphones by connecting with your Smartphone or Tablet. This is the perfect helmet for those of you who love listening to music while riding a bike, or if you are going on a long journey and want to buy something that will be easier to use than plugging in your headphones inside your helmet. You can also use the helmet to receive calls and listen to directions from your phone. The shell of the helmet is made of a thermoplastic alloy material that makes it sturdy and durable. The shape of the helmet is oval in design and provides a snug fitting around your head. The helmet is designed with laser contoured shape that is perfectly made for those riders who have an oval shaped head. The visor of the helmet can be dropped down and locked when you want a full face helmet, and it can be pulled back easily when you want a half faced helmet, making it a very versatile product. The flat panel design of the visor is optically designed for ergonomic style and optically correct vision. The inner lining of the product is also laser contoured for a good fitting. It is soft and comfortable and it can be removed easily. You can wash the inner lining with hand or inside a machine to maintain the cleanliness of the product in hot weather. Besides black, the helmet also comes in blue colour and the design is also variable. You can choose a flat back helmet for a bull head design according to your preference. The product also meets safety standards set up by ECE, DOT and FMVSS 218, so you can rest assured that it will protect your head well in case of an accident. 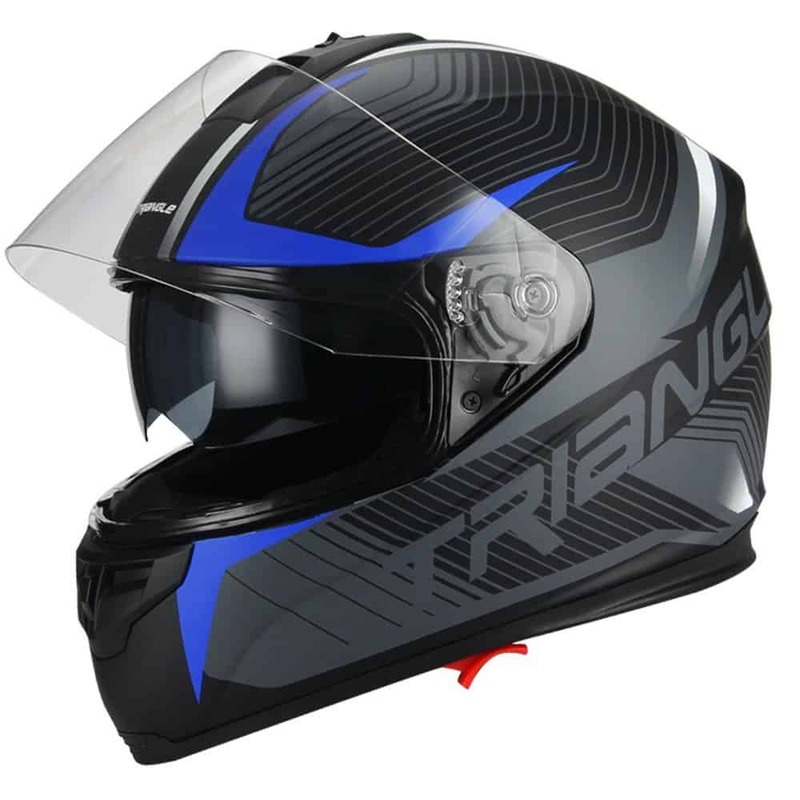 The full face helmet by Triangle is one of the most well rated and trustworthy product in the market when it comes to motorcycle gear. The helmet has DOT approval, which makes it durable and solid when it comes to protecting you from harm. The helmet comes in several colours matte white, blue, green and black. The shell of the helmet is made of an advanced thermoplastic material which protects it from heat as well as makes it one of the most strong helmets in the market right now. It is lined by Expanded Polystyrene which serves several functions like making the helmet stiff and durable to prevent breakage during hard impact, lightweight to avoid heavy weight on the head of the rider, cheap to make the product accessible, and easy to ventilate to avoid suffocation during hot environment. The helmet also has a perfect ventilation system with vents placed on top and bottom of the helmet. This function helps in maintaining air flow inside the compartment when the weather gets stuffy and the temperatures rise high. The helmet also comes equipped with removable DVS treatment that allows easy exchange mechanism system for the visor. Another important feature about the visor is that it has a double lens that negates the use of sunglasses during the day. It also comes with an anti scratch layer to protect the integrity of the glass. The padding inside the helmet is cut with laser and is made of soft and comfortable material. It also has a dry comfort feature which allows for hygienic and clean environment inside the helmet. The interior liner of the helmet can be removed at will. You can also wash the material with hand or in a machine. The material is also antibacterial in nature and prevents growth of harmful microorganisms. The chin strap of the helmet is provided with extra padding for maximum comfort and offers micrometric closure for advanced and well fitting mechanism. 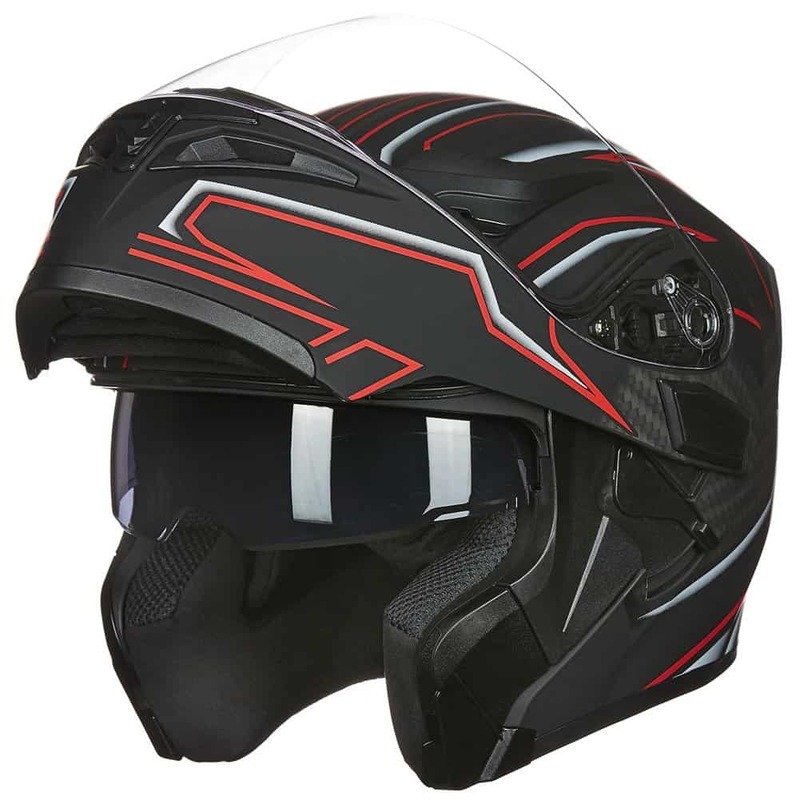 Available in four sizes ranging from small to extra large and with the rating of 4.5 stars, ILM’s Dual Visor Full Face Helmet comes in a variety of colours ranging from black, red, white, yellow and blue. The company boasts of providing a product that is perfect for riding in the city as well as countryside. The helmet has a wide array of features that make it the best in terms of ease of use, comfort and safety of the rider, along with the increased functionality and top notch performance. 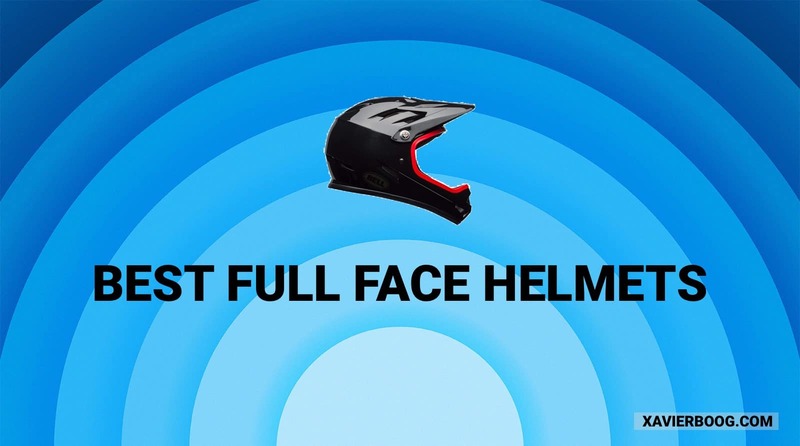 it is a very versatile product as its functions both as a full face helmet as well as half face helmet. The outside of the helmet is made up of ABS shell alloy that is highly resistant to breakage and is the perfect material that will keep you safe in the event of an accident. The strap of the helmet is micro metrically adjustable, so that you have a snugly fitting helmet around your head. This feature is essential so that the helmet doesn’t fly off in the event of high intensity impact. The helmet is lined with lightweight and soft cheek pads that are not only comfortable and cushy for the user, but they are also easily removable and washable with machine or hand to maintain cleanliness and hygiene inside the helmet. 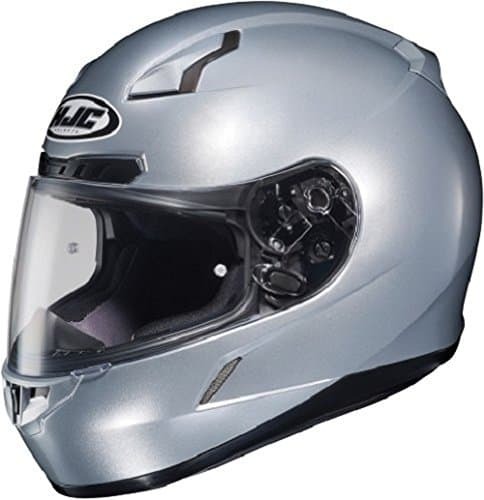 The design of the helmet is created in such a way that not only is it stylish and sophisticated looking, but it also has an aerodynamic construction which not only prevents air resistance and helps in better movement of the the helmet in high speed, but it also helps in reduction of wind noise on highways and open spaces. The visor of the helmet is modular and has a flip up design which is easy to use. It is also very easy to modify the helmet from full face to half face by simply clipping of the chin guard. The glass of the visor has an anti scratch and anti UV type of function which prevents damage to the glass as well as provides clear view during bad weather conditions. The wide view allows for ease during driving. The visor has an additional important feature which is that it is a dual lens kind. The inner visor is tinted for use during bright sunlight and outside lens is clear for use during bad weather and at night. The inner visor of the helmet can be removed without having to open the outer one, which is pretty handy. When the chin strap of the helmet is closed, it is perfectly integrated with the rest of the structure of the helmet making it an excellent full face helmet. On the other hand when the chin guard is open the helmet functions as a half face helmet, as it reduces the sail effect on the product. The company also has a policy of sending free inner pads in case the product does not fit the head of the user. The helmet meets all the safety standards set up by FMVSS 218 and DOT. One of my most favourite features is that it has vents on the front and top that allow for streamlined airflow inside the product and prevent suffocation in hot weather. HJC is probably the most versatile helmet in the market right now as it comes in a variety of sizes from extra small to triple XL large. The product has a 4.5 ratings on Amazon and retail price of $130.49. It comes in a variety of colours from matte black to silver, white, red and grey. The outside of the helmet is made of Advanced Polycarbonate Composite shell which has several advantages. The shell is light in weight so it is extremely comfortable for the rider to use the product for a prolonged period of time. Additionally, the shell is easy to shape and that is why it provides a very good fit and comfortable use by customers. The helmet has been created by using advanced CAD technology. The visor of the helmet has an anti scratch, pin lock mechanism that prevents flipping up of the visor in case of high impact accidents, protecting you from fatal injuries. It also has a side shield lock mechanism for extreme sealing of the head inside the helmet, making it one of the safest helmets in the market right now. The visor of the helmet also has a 95% UV protection and an anti fog system to prevent fogging of the glass in bad weather conditions. Separate pin lock insert is sold to make the helmet an ultimate anti fog machine. This product also comes with rapid fire shield replacement system, which helps in quick installation and removal of the the shield without using any tools. The system is extremely simple, secure and very quick to perform. It also has an excellent ventilation system equipped with ACS advanced channeling ventilation. There is a system of blowing air from the front of the helmet to the back of the product, which flushes out heat and humidity upward and outward, making the helmet easy to use for riders during hot weather. The interior of the helmet has a moisture wicking liner, which ultimately soaks up all the sweat and humidity. The liner is also infused with super cool technology which keeps the insides pleasant. I love that the cheek pads and the liner are easily removable so you can wash them. The liner is also antibacterial in nature to prevent growth of harmful microorganisms. Additionally, in the cheek pads are easily interchangeable, you can get the ones that make your helmet as snugly fitted as you require. The sophisticated and stylish Modular Full Face Helmet is made of of ABS shell material that is light in weight and sturdy when it comes to encountering high impact. That is what makes this helmet one of the best in the market right now. It comes in various sizes from small to double extra large, and it is available in two colours – white and black. The helmet is perfect for street bikes, racing, cruising and scooters. It is designed in such a way that it can be used by both men and women. The design of the helmet is aerodynamic, that is, it reduces wind resistance and noise when travelling on the bike at a high speed. The outside of the helmet is made of Ethylene Polystyrene which is cheap and lightweight. The chin strap is reinforced with multi density material to provide extra safety. The chin strap also has a quick release buckle which makes it refined and more easy to use. Additionally the ventilation system is designed in such a way that there are specialised intake and exhaust vents in front of and top of the helmet. This creates an air flow inside the helmet that keeps the head of the rider cool in hot weather. The inside of the helmet is lined by soft and squishy pads which are fully removable. You can wash the inner lining with hand or machine to keep the helmet clean and fresh. The products also has a specialised design that is ideal for fitting prescription glasses as well as placing a Bluetooth headset inside the helmet. The visor of the helmet is dual tinted and can be used with the press of a single button. Now you can easily switch from tinted visor that is to be used in extreme sunlight to clear visor that is helpful at night. In case of scratching or damage to the visor, it is easy to remove and install a new one without use of any extra tools. One of the coolest headgears available on the market these days is the Scorpion Exo Covert Unisex Helmet that comes in 9 different sizes, ranging from double extra small to triple extra large. What it basically means is that whether you are a man or woman, adolescent or adult, you will certainly find your right size with this product. It is also vouched for by customers, as it has a rating of 4.5 over 200 customer reviews on Amazon. 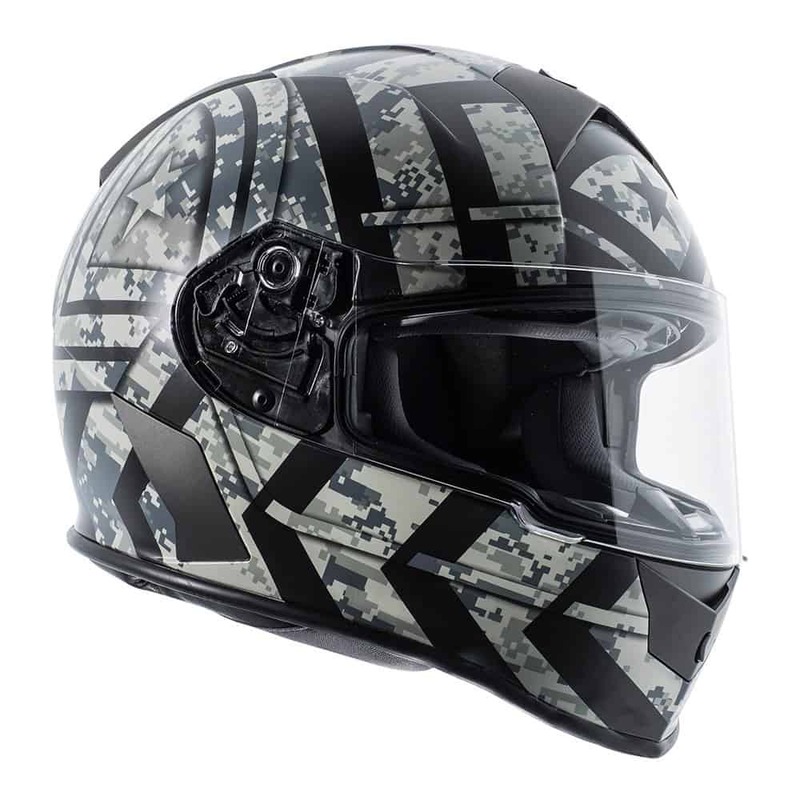 The helmet is made of Advanced Polycarbonate Shell which is exclusively designed by Scorpion. The material of the helmet is lightweight, so that there is not any extra weight on top of the head of the rider. It is also extremely durable, and it tends to diffuse the forces when there is an impact. The visor of the helmet is double lensed. The tinted part of the visor is ideal for hot days and wearing in low light conditions to allow minimum strain on the eyes. It comes with dark smoke feature installed. The clear visor is ideal for riding at night time when light is already low. The tinted visor can be retracted with the push of a button, so it is extremely easy to use. The front part of the helmet can be removed, making this a half face helmet. The attachment mechanism is via neodymium magnets. The helmet is constructed with dual density Ethylene Polystyrene material, that is cheap, lightweight and easy to mould into the shape of the helmet. Inside of the product is lined with removable and washable pads that are antibacterial in nature and comfortable for the rider for prolonged use of the helmet. The inside material will also keep the rider dry in warm weather as it has sweat soaking abilities. The outside of the helmet is coated with a clear paint that allows blocking of of UV rays, making it a durable product. One of the biggest USPs is of this helmet is that it is very versatile and it can be easily transformed from a three fourth open face comfortable helmet to a badass full faced, aggressive helmet by attaching the front mask with the help of a comfort sleeve. This is one of the cheapest helmets on this list, and it comes in three sizes – medium, large, and extra large. To find out your best size, you can simply wrap a piece of thread over your brows and compare with sizes mentioned in inches. The helmet is quite well rated for its price, with a four star rating by 200 customers. It also has DOT approval. The outer shell is made of lightweight, aerodynamic material that reduces wind noise for the rider when he is travelling at extremely high speed. It also reduces air resistance. The thermoplastic material is an alloy shell which is easy to shape into the design of the helmet. It comes in a variety of colours – black, red, silver, blue, pink etc. The outside of the helmet is covered with clear UV protective paint which protects it from damage from harmful rays of the sun for a very long time, so this product will stay with you for several years without showing any signs of external damage. Additionally, the inside of the helmet is lined with removable and washable pads, which are not only easy to to take out of the helmet, but you can also wash them with machine or with hand. The helmet is heavily cushioned on the inside to provide comfort in long journeys. The visor can be lifted up. This is one of the biggest drawbacks of this helmet, that it does not come with a dual tinted visor. What this means is that in extreme sunlight and varying light conditions, you might have to use a pair of sunglasses. The visor also doesn’t come with anti scratch or anti fog layer which is quite common in helmets these days. But one of the advantages of the visor is that it can be easily replaced without using any tools. So for someone who travels long distances during the day, you can easily replace your clear shield with a tinted one. The helmet also has a good ventilation system to keep your head cool and dry during hot weather conditions. 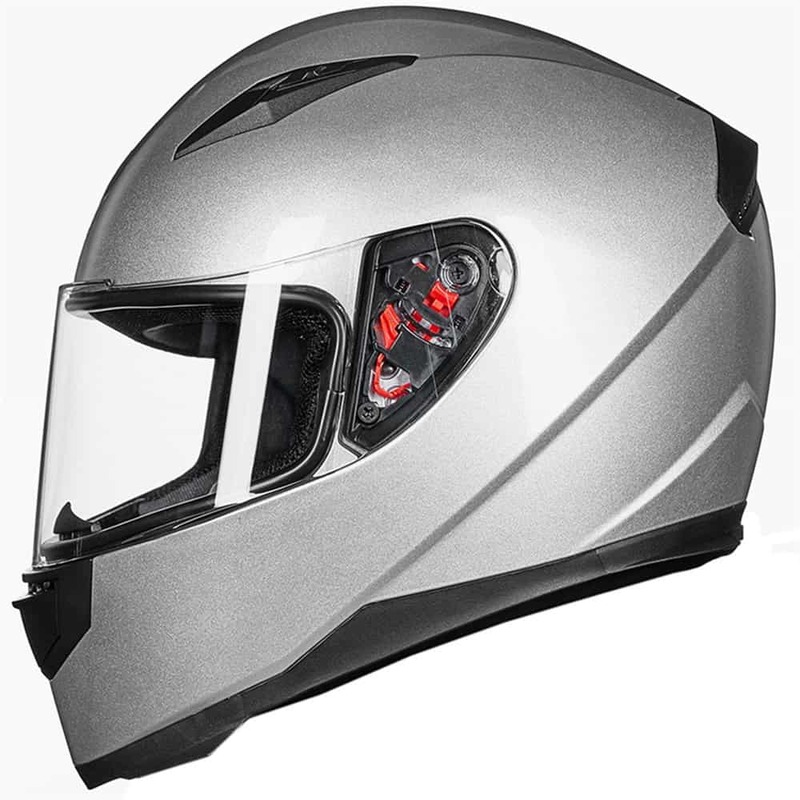 With a four point five star rating from nearly hundred customers, this helmet comes with the widest range of features and that is makes it an attractive product. It comes in two colours – matte black and matte white, and 5-size ranging from small to double extra large. The helmet meets regulations set up by DOT and FMVSS 218. 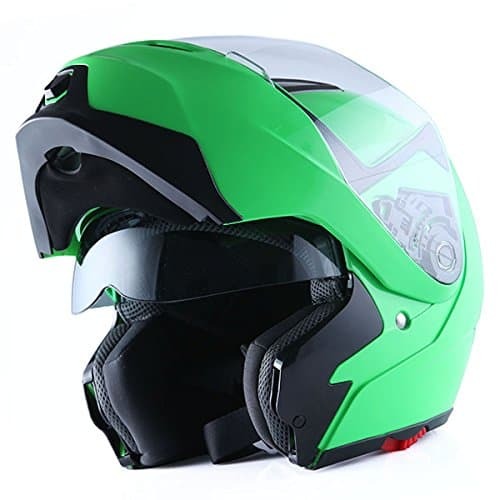 It is the perfect helmet for your needs whether you are going to go for street biking, racing, cruising, or using scooter. The design of the helmet is such that it can be used both by men and women. The outside material is Ethylene polyester which is lightweight and easy to mould into the stylish shape of the helmet. The design is such that it is aerodynamic in quality and integrated with ABS shell, which makes it sturdy on impact and diffuses the forces without breakage. The chin strap is reinforced with additional material to make it comfortable for prolonged use, as well as a quick release buckle is integrated for hassle free usage. 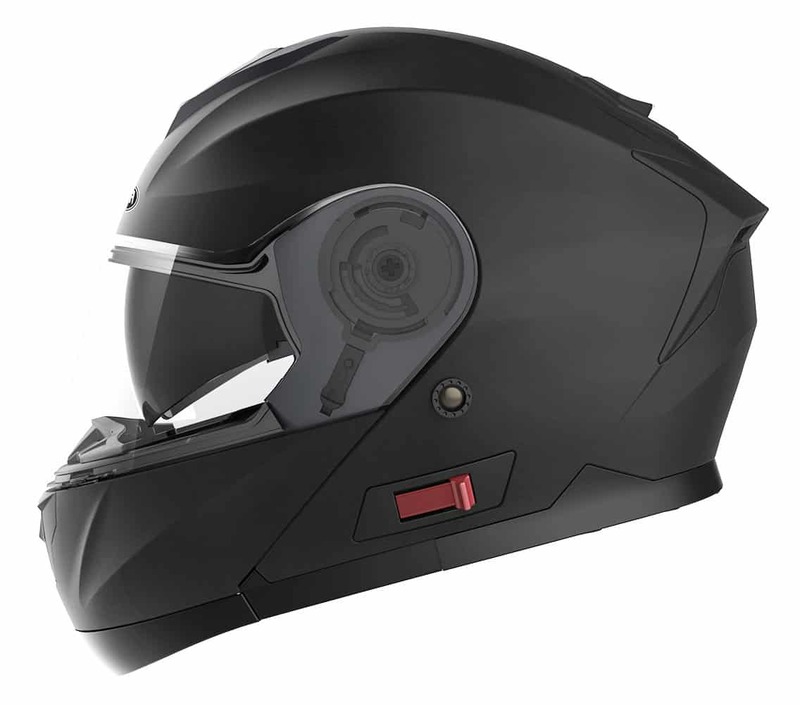 The product also has a fully adjustable ventilation system with intake and exhaust vents that create a streamlined airflow inside the helmet. So when you are riding in hot weather for a very long period of time, your head won’t feel sweaty or uncomfortable. The lining is made of pads that are fully removable and washable. There are also cushioned and comfortable for longer journeys. You can easily remove them and wash them to keep your helmet smelling fresh and clean. There is extra space inside the helmet for glasses and bluetooth speakers. The visor of the helmet is tinted to help see clearly in high light conditions and negates the use of sunglasses. But if that is not ideal for you, you can remove the visor without any extra tools and install a clear visor. 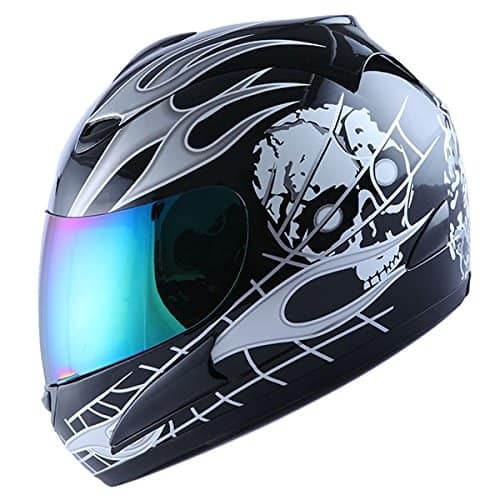 This extremely stylish looking helmet is also the cheapest on this list here. And despite that it has the highest rating with the highest number of customer reviews. Over 4 star rating with nearly 800 customer reviews is not something that any other product on this list can boast of. It comes in 6 sizes ranging from extra small to double extra large and it comes in black colour which is glossy on the outside. It is made of ABS thermoplastic reason that is light in weight on top of the head of the riders and so durable that it does not shatter on impact. The helmet meets and exceeds standards set up by the DOT. It also meets standard setup by the Federal Motor Vehicle Safety Standard (FMVSS) 218. 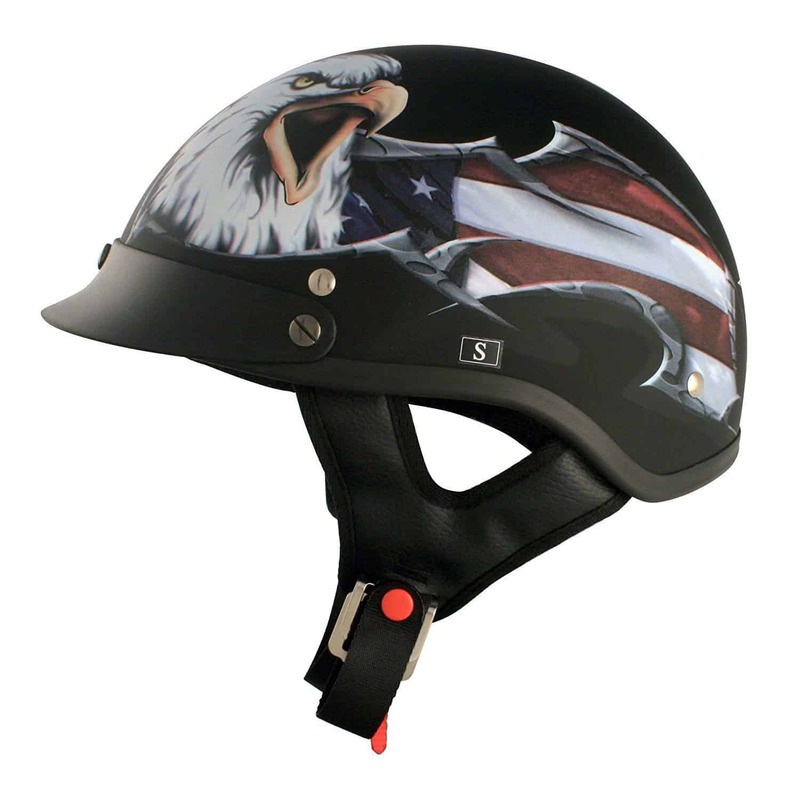 The top of the helmet has a eagle and flag graphic that is extremely sophisticated and stylish looking. The insides are fitted with cheek pads that can be removed and washed at your will, so that your helmet is clean and fresh. The lining is also extremely comfortable for feet and prolonged usage of the helmet. The inside material is microfiber blended, which is famous for repelling odours and drawing out warmer air to keep the riders’ head cool. The chin strap of the helmet comes with a D ring security, that does not unlock on impact, making it one of the most secure helmets in the market. However, the chin strap is made of Nylon which cannot be very comfortable for long periods of time, so keep that in mind while buying this product. Although the visor of the helmet is clear, that is, it cannot be used in harsh light conditions, it is certainly easy to remove the visor without use of any tools and reinstall any kind you like. The visor is also installed in such a way that there is extra durability and protection to the face in case of an accident. The helmet also claims to have a dual layering core at the top which absorbs the force on impact instead of transferring it to your head, protecting the rider from any damage in case of an accident. This guide isn’t based on thoughts or beliefs of a single person, Our team spent more than 6 hours in deciding the things we should include in this guide. Besides our team, there were several members who’ve been a part of our community who added up a lot of things which they consider. For those who are short on time, just look at the points and you’ll get an idea about product selection. Make sure that the helmet fits your head and has a shape of your preference. Make sure that the one you purchase fulfills the cause for which it was purchased. Make sure that the helmet has safety ratings. Make sure that the helmet matches the type of bike you ride. Make sure it fits under your budget, there’s no point in buying an helmet which has so many features which you don’t need and costs a lot. If the helmet you are looking at satisfies the above-mentioned criteria, then it definitely is the best choice. However, the above points are very broad and there’s a good chance that you might need a little more clarity on the same. Don’t worry, just continue reading this till you are clearly able to select the best one. Would you ever like to wear a shirt which is very tight or very loose? No, right? Your head also doesn’t like a helmet which doesn’t fit properly. Before making a purchase, make sure that it has the perfect fitting for your head. This fitting is subjective to people, some like it fit, some prefer it a little lose and some prefer it very tight. The one which feels comfortable on your head is the one you should be looking forward to buying. However, make note of the fact that Helmets which are better fits tend to be a little tight at first. They tend to shape themselves around your head better as you keep wearing them, not unlike leather products. So buy accordingly. You can purchase a light helmet, or a heavy helmet. The weight of the helmet itself hardly matters as long as the quality of construction is good. The real factor in helmet weight lies in how snugly it can fit your head without crushing it. If you purchase a helmet that is too loose, it will feel heavier on your head seeing how it is properly aligned with the centre of gravity on your head. Purchase a helmet which is too tight, and it may feel lighter, but you’ll end up feeling crushed and suffocated at the same time. Hence, you’re looking for something which is a little tighter than just right. That, way the helmet will shape itself around your head gradually to give you the most comfortable fit without feeling too heavy. Otherwise, your helmet will be a deadweight on your head which is ready to fly off the second you get into an accident. The Long Oval Shape: The helmet is longer from front to back, than it is from side to side. The Intermediate Oval Shape: This is overall circular with equal distance between front to back and side to side distances. Round Oval Shape: This helmet is longer from one side to the other than it is from the front to the back. A good helmet should make it difficult for you to slide your fingers inside with ease while not crushing your head at the same time. Always try wearing your helmet before you purchase it. Safety is no joke. Finally, a good helmet should have a firm chin strap attached to it which snugly holds on to your chin and won’t slide off easily or open accidentally. There are a few ways to test the fit of your helmet. You can do all of the following tests, or just a few. In any case, the helmet should pass at least three of these tests to qualify as a properly fitting one. You should not be able to push your fingers into your helmet with ease. The visor or the viewport should rest just above your eyebrows. Your helmet should not move when you nod your head. Your helmet should not rotate freely on your head. The padding on your neck should not push it away from the back of your head. The chin piece should not touch your chin or your nose. If your helmet has cheek pads, they should be touching your cheeks, not squeezing into them. The helmet should be firm against your skin but it shouldn’t press inwards. If your head feels sore in some places after you take your helmet off, it is too tight. With that, we conclude the most important part of a helmet, the fitting. Even the best helmets will not provide protection if they don’t fit properly. If a helmet is too loose, it’ll slide off your head or cause your head to hit around inside the helmet during a crash, causing blunt force trauma. In contrast, a tighter helmet does more than applying undue pressure on your skull. In the event of a crash, it is going to distribute more force into your brain, which can cause concussions and other forms of brain damage. These kinds of Helmets, as the name suggests, cover the full face and head of the rider, from the chin, all the way to the back of the head. The front viewport of the helmet is covered with a visor which can usually be pushed up or dropped down. There is nothing exposed in this kind of helmet and as a result, this offers the most protection on road. Three-Quarter Helmets or Half Face Helmets are marked by their absence of chin and face protection. In other words, they cover the three quarters of the head: the sides, the back, and the top. But they leave the most vulnerable part of the skull, the face, exposed. While this does have some advantages over a Full Face helmet, protection against crashing on your face far outweighs them. As a result, we recommend avoiding this type of helmet unless necessary. And if you do get it, always secure it by tightening your Chin strap as much as possible. Half Helmets offer the most minimalist protection available. In fact, the protection is so minimal, that we recommend that you only use these if you’re riding a bicycle. Accordingly, keep away from these unless you’re riding a motorcycle at a very casual place in an area where damage to your head might not be a major concern. And always tighten your Chin Strap! Modular Helmets are designed to provide complete protection to the head while featuring a removable face shield. This is essentially a mix of the Full Face and the Open Face Helmet. While this type does offer the best of both worlds, it does lack in a few areas of protection. Off-Road Helmets are made for Off-Road Biking and other Extreme Sports such as Motocross and Dirt Riding. These helmets are marked by the presence of sun shields on top of the helmets and an elongated chin area. These helmets are built with excessive ventilation as they’re meant for intense, rough rides and not for racing or riding on the highways. Dual-Sport Helmets are designed keeping in mind the necessities of both Full Face Helmets and Off-Road Helmets. While they are ideal for those who wish to purchase two helmets for both Off-Road Biking and Highway Riding, they are more of a jack of both trades than kings of either. This is the list of all the types of helmets which you will find for riding on a bike. Make sure you go through the list as many times as is necessary to give you a better understanding of which helmets you wish to purchase. We always recommend that protection should be the first priority. However, there is no call to spend more than necessary on something that you do not want. Hopefully, this will guide you in making a better and more informed choice. The dense Inner shock absorbing layer. Now let’s look at each layer in detail. A Polycarbonate outer shell is the most fragile of all. While it is really hard, it is also quite brittle. During a crash, this material generally flexes upon impact before breaking up and shattering quite like glass. While this sort of an outer layer, does break up quite easily, it still protects the head of the wearer. It is quite weak against sharp forces and does not provide much protection against friction. Fibreglass Composites are generally more flexible and expensive as compared to Polycarbonate materials. They are also lighter. This material generally Flexes inwards, crushes and dents, and occasionally splits during a crash. This sort of material also distributes quite a reasonable amount of shock over its surface, protecting the wearer. This material is comparatively more durable against friction and breaks with greater difficulty when subject to sharper forces. Carbon Fibre materials are the hardest and lightest material to construct a helmet with. This material is extremely flexible and dispenses a surprising amount of shock around the entire surface of the helmet. The best part about this material is that it is especially difficult to break given its flexibility. This material is great against all three kinds of trauma which you helmet can suffer: blunt force, sharp force, and friction. The Inner layer of the helmet should be composed of Expanded Polystyrene (ESP) foam. The special attribute of this foam is that it is quite soft, even though you won’t realise it as it is quite densely packed together. The dense, but soft nature of the foam acts as a very slow moving fluid and distributes the impact faced with your helmet all over it, giving you extended protection against the sheer blunt force of a crash. This is where a proper fit is desired. If the helmet is too tight, it will simply distribute the blunt force into your skull and directly into your brain, which can cause a lot of brain damage. The comfort layer is designed to keep you comfortable, but not too comfortable. This layer can be made using many softer materials, but the point is to make sure that it does not feel like a rock against your head. It should have a firm enough grip on your head that it’s very difficult to move your helmet without moving your head, but not so firm that it practically presses against your face, giving you bruisers and overall facial soreness. When you look for a mark of quality in something, you often refer to different brands for reliance. The same goes with helmets. While brands do offer an assurance of the quality of their products, there are companies present out there that test helmets and certify them for you so that you can rest assured about the promised safety that they provide. These testing organisations try out all models of helmets and put them through various practical tests to see what they can withstand and what makes them crack. After rigorous testing, these helmets are provided with a rating and a certification from these companies which guarantees their quality on behalf of the company which performs the testing. Apart from companies which test motorcycle helmets, there are also Governmental guidelines for every State which are recommended for the design of a helmet. Since they differ from country to country, we recommend that you go through your local Governmental guidelines to get an idea of what they demand. Helmets don’t necessarily need to conform to these guidelines, but any helmet which does conform, will be market at compliant. DOT: The standard for helmet safety as set by the United States Department of Defence. ECE22.05:The standard for Helmet Safety as set in Europe by the United Nations Economic Commission. Snell: The Snell rating was found after the death of a sports car racer, Pete Snell. It approves of helmets it thinks are safe enough to race in. SHARP: SHARP tests and rates helmets out of five stars based on various parameters, with four stars or above being safe for racing purposes. ISO: The standard of safety as set by the International Standards Organisation. While the rest of these ratings might not be available to the world, the ISO has a worldwide reach. While additional safety features don’t necessarily work to help improve rider safety, they do aid the rider in multiple other aspects of their ride, including communications, recording, breathing, and a wide variety of other factors. Some even go as far as helping Emergency Medical Teams save lives easier. With the benefits that they offer, we highly recommend that you take a look at what is being offered as they greatly help increase the comfort of wearing a helmet. They can also help by being a riding utility. The following are a few other features found in motorcycle helmets. A visor is one thing which any helmet should have. This greatly helps during rainy weather by keeping water away from the wearer’s eyes and during high speeds by keeping the wind out of the rider’s face. It is a simple shield which can be flipped up and down in front of the face. While most helmets come with a visor attached, they are some that don’t and it is a more than recommended addition to your helmet. Ventilation is all letting air in and out. While there is no need for ventilation in Open Face and Half Helmets, ventilation is a must have in full face helmets. Otherwise, the build up of Carbon Dioxide inside the helmet while wearing it can easily lead to greater problems in the long run. Furthermore, it can also cause dizziness, nausea, or even unconsciousness during longer rides, and will definitely lead to suffocation. While a quick release retention system like a buckled chin strap might make the helmet’s strap a little more slippery, companies today make sure to make them tight enough to make the helmets safe. In contrast to the traditional threading systems like D Rings, these greatly improve the ease with which a helmet can be strapped and unstrapped even with gloves on. These are like sunglasses inside the helmet. They can drop down if required to protect you from bright sunlight when required. This can prove to be especially useful if you don’t like putting on your helmet while using aviators, or constantly need to adjust your sunglasses inside the helmet, but can’t do the same. With these installed, you can simply flip them down when required, and flip them back up when they’re not. Furthermore, they are also designed to accommodate spectacles and prescription glasses. There are various kinds of coating available for your visors which would help you see better under harsh sunlight. These are primarily available in three variants. Tinted Visor: A thin translucent film is added on top on your visor. Photochromatic Visor: These visors are made of a Photochromatic material or have a similar coating on top which makes the visor turn darker as more light shines on it and normal under lower light. Reflective Visor: These visors have a thin coating of reflective film on them, which reflects all light. We would recommend that you always go for the Photochromatic Visors if available within your budget. They behave like sunglasses under bright light by turning darker, while they remain normal under low light, constantly adapting themselves. In contrast, the Reflective Visor may block more light, and the Tinted Visor may block just as much light as the Photochromatic variant, if not lesser, they constantly block all light, making using the visor quite dangerous in low lighting conditions. These are newer improvements to helmets which make the job a lot easier for Emergency Medical Teams to save drivers who have recently met with an accident. While helmets are supposed to be snug fit, they can pretty difficult to remove, especially by others and that too when the rider is unconscious and non-compliant. Hence, these helmets have come up with ways to safely remove or eject the helmet from the outside when worn by a rider. This allows Medical Teams to quickly and safely remove the helmet from a rider who would otherwise be suffocated by the lack of oxygen within the helmet. This also helps prevent further injuries to the victim of a crash. Communications Gear are greatly appreciated when travelling long distances or in speed. Especially if you’re wearing a Full Face Helmet. You simply cannot talk with those helmets on. That’s where Bluetooth based Communications devices can be really helpful. Specifically when you’re riding in groups. These devices are designed to fit inside your helmet without the need of additional space, so you can rest assured about having to find the extra space to accommodate them. Alternatively they can also be used to listen to some music, even though we highly discourage that for obvious safety reasons. There are many action cameras like the GoPro which can be mounted on top of your helmet during a ride to record the entire journey. These can also double up to add as security in case you get into minor accidents, or someone tries to threaten or rob you. The greatest appeal of these, however, is their use during sports like Races or Off-Road Biking where you can capture the thrill of your ride perfectly. Breath deflectors are designed to force your breath down and out of the holes present near the chin piece of your helmet. These are especially useful during rainy or cold weather where the moisture in your breath can easily fog up the visor. It is a device which comes in various sizes and shapes and greatly improves the quality of a ride. While this is of no use in Half Helmets and Quarter Face Helmets, These come highly recommended with any Full Face Helmets. Specifically so if you’re living in areas which can turn cold, or have a high possibility of rain. Or even if you’re planning to ride to someplace similar. Anti-Fog Coatings are quite similar to Breath Deflectors in the aspect that they both seek to achieve similar things. Both of these aim to keep your visor clear of any fog or frost build-up. However, while the Breath Deflector focuses on getting rid of the fog from your breath, it does not quite get rid of fog from natural sources. As temperatures get lower, or the weather gets more and more humid, chances are, even the release of gasses or heat from your mere skin can be enough to cause fogging on your visor. While this is certainly not a replacement for the Breath Deflector, this is a much-needed addition to all kinds of helmets, full face or not. This works in conjunction with a breath deflector to keep your visor completely clear of any kind of fog. This is especially useful if you’re into riding longer distances on your bike. Now these were all the available options you could go for. However, you do not need all of them crammed into one helmet. Wisely pick the ones which you would require in your helmet and those which you would not. There is no call to spend more on features which you may want, but wouldn’t have any use of. 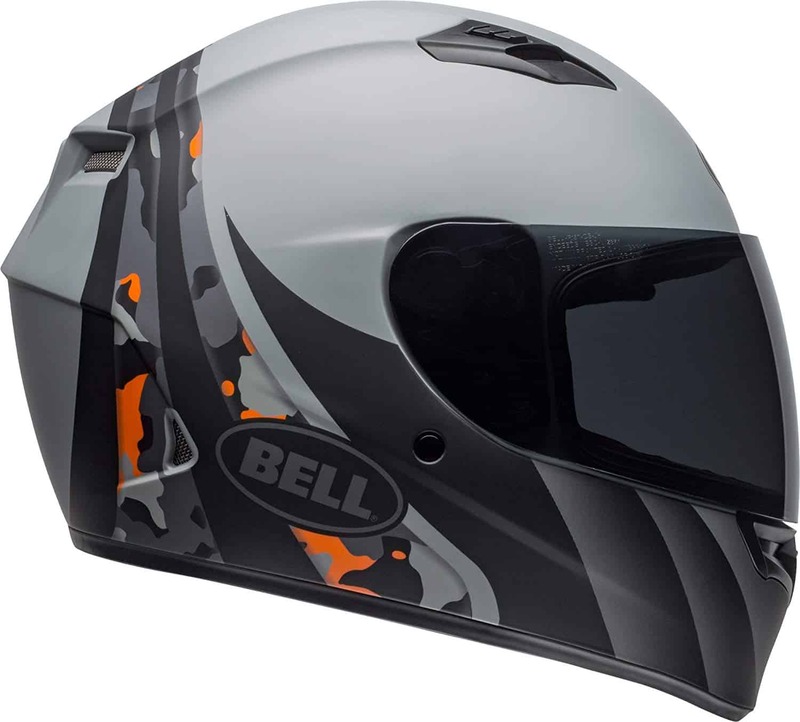 The Bell Qualifier Helmet is the perfect product for those of you who are looking for a safe and sturdy helmet which retails at a reasonable price, and that comes equipped with all the essential features. If you do not care about bells and whistles too much and all you want is a durable product that does its job, then your best bet is the Bell Qualifier. It has all the required features, like dual visor, aerodynamic design, and ABS shell that it is sure to protect you for a very long time. For just $100, you get the best the market has to offer right now. I personally believe that this is a pretty good deal. 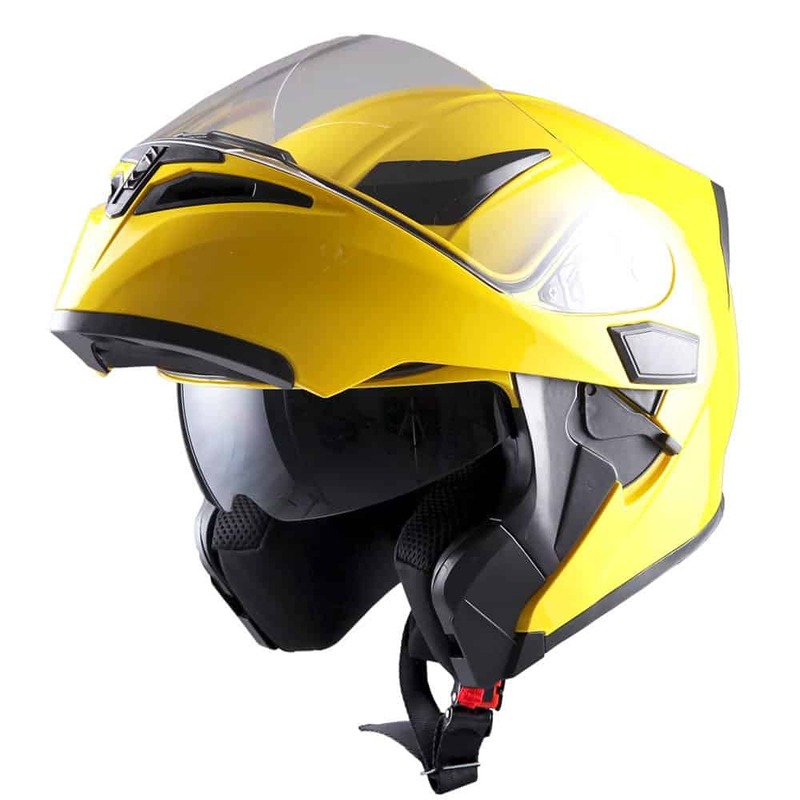 ILM has made a good name in the helmet market and the Full Face Motorcycle Street Bike Helmet is another stunning product that is ideal for the individual who cares more about features rather than good looks. One of the best features of this helmet is that it comes with a neck scarf that can be fitted right into the helmet and is ideal for those of you who live in places that have cold weather consistently through the year. 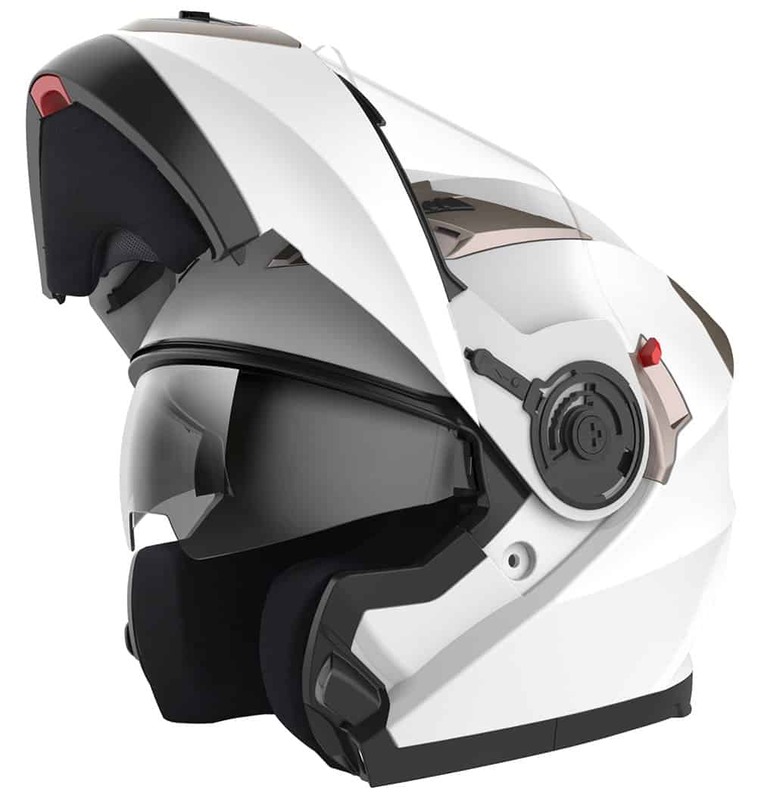 If you are a tech savvy individual who wants more from his helmet then just regular features, then you should try the Torc Integrated Full Face Helmet that comes with Blinc Bluetooth system that is fully installed and integrated into the helmet. Now you can use your helmet as headphones for listening to music, receiving calls, and even getting directions from your phone. Just connect the helmet with your smart device and you are good to go. This feature is rare in helmets available in the market right now, and if it is an absolute non negotiable feature for you, you will not find a better product than the Torc Integrated Full Face Helmet. The ILM Helmet with Dual Visor is another good product with a wide array of features and as the name suggests, a dual visor that can be easily replaced and removed. Another one of the major USPs of this product is that the design is so crafted that there is a significant reduction in wind noise. You can use this helmet as a full face helmet or half face helmet, depending on whether you want to use the chin guard or not. This further adds to the versatility of this product. Best Bell Full Face Helmets: Why Settle for Good? Copyright © Helmet Finder. 2019 • All rights reserved.